Near Kenmore Cottages in the Adirondacks on Fourth Lake it was a beautiful Fall morning. It was chilly outside and the leaves on the trees were beginning to change color. Here nearby the Kenmore Cottages was a nice little boggy marsh and these ferns were turning a lovely golden yellow. I was surprised to find movement down by my right foot down in the marsh and found a wild duck was there following me around. Apparently he was looking for food. It was a very chilly morning out in the Adirondacks on Fourth Lake at Kenmore Cottages. This was just at sunrise (at our backs) and the mist had just started to rise. To the left was a lonely swimmers dock that had not seen many brave the cold water lately. To the right is the shoreline of Fourth Lake near Kenmore Cottages. It was early morning on Fourth Lake at Kenmore Cottages in the Adirondacks. I was waiting on the chilly dock over the water of the lake for the sunrise and out of the mist I saw a small figure paddling towards me. At first I thought it was a duck, but as it came closer and closer I saw it grow in size to an immature Loon. He must of been lonely and wanted company because he swam right up near me and started preening for 20 minutes. I didn’t have a long lens, only the wide angle on the camera. He stretched his wings and turned over exposing his white belly and preened and flapped several times. He just wanted some company. Near our base camp of Kenmore Cottages on Fourth Lake in the Adirondacks there is a lovely low area with wet ground and marsh. Here a tree had been cut out long ago and the green moss has grown up and completely covered it. The ground is covered in ferns in this very low and wet area. This is early in the morning on a chilly Fall day. After walking out on the dock in the pre-sunrise hours on Fourth Lake in the Adirondacks, we look back at the shoreline at Kenmore Cottages itself. You can barely see the outlines of the cottages with the mist and low light. It is chilly on this Fall day North of Old Forge, New York. The air is still a chilly 45 degrees out. If you get up very early in the morning here at Kenmore Cottages on Fourth Lake in the the Adirondacks, you can usually see lots of fog or mist on the water. Here it is about 5:45 am and the sun is not up yet on this Fall day and its about 36-40 degrees out. The fog is covering everything and then as the sun comes up behind it all over the mountains, there is a glowing light on the horizon. In the very early morning in the Adirondacks at Kenmore Cottages on Fourth Lake, the sun has just risen and the water is super still. This makes it reflective and you can see the high clouds reflected from the sky in the smooth water of Fourth Lake. There are no speedboats out on the lake yet so the air is quiet. This is a view of the early morning mist starting to rise off of Fourth Lake in the Adirondacks at Kenmore Cottages. When the sun hits the water it warms the mist and causes it to rise like a cloud over the lake. It is early Fall and very chilly out in this early morning view with a few trees starting to show some early color. We stayed at Kenmore Cottages again on Fourth Lake in the Adirondacks in upstate New York. It was Fall and I would go out frequently in the morning lake mist to take photos. I took a photo from this position and then went down to the dock on the lake. It was a chilly 38-40° out with frost forming on the aluminum planking so you had to be careful not to get too close a view of the water. 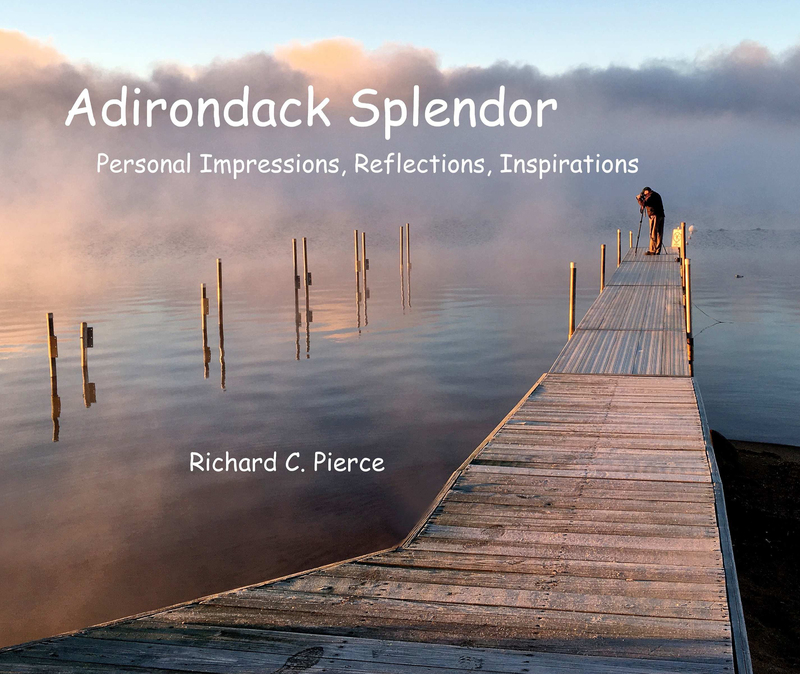 Here, my friend Richard Pierce took the same photo but with me in it and used it on his book cover of “Adirondack Splendor”. I was surprised and happy to be part of the photo. After the sun is up on Fourth Lake in the Adirondacks, we can see a little better and find more of the cabins and structures of Kenmore Cottages. They have many cabins with fireplaces on the lakefront and even more up the hill with great views. The fog is still there but dissipating fast.